We’re always on the lookout for interesting eating and drinking opportunities (preferably at a bargain price). We’ve spent at least a year nagging the powers at Nederburg to release archive wines for us to use in themed lunches/dinners at The Red Table. We were delighted when they finally invited us to select from a bunch of wines that are 10 years old (and older … except for the white wine, of course). We were even more delighted when they turned out to be Auction wines. We’re very excited about the selection we’ve made of perfectly aged wines, from Viognier to Merlot to Bordeaux blend to absolutely scintillating Riesling Noble Late Harvest. Getting access to these wines was quite a coup, if we say so ourselves. Quince bavarois creme with phyllo pastry layers topped with a Rooibos infused froth. You’ll note that the wine is listed first, because this is about allowing the wine to shine. This is not the time or place for culinary pyrotechnics! These are wines that sell for hundreds of rands per bottle. We’re offering the entire experience – four courses, plus a glass of wine with each course – for just R360 per person, for groups of 10 people. There are various dining areas in- and outside the manor house, but the original dining room is particularly grand, with a table that seats 10 people in baronial style.Wine quantities are limited so don’t delay! 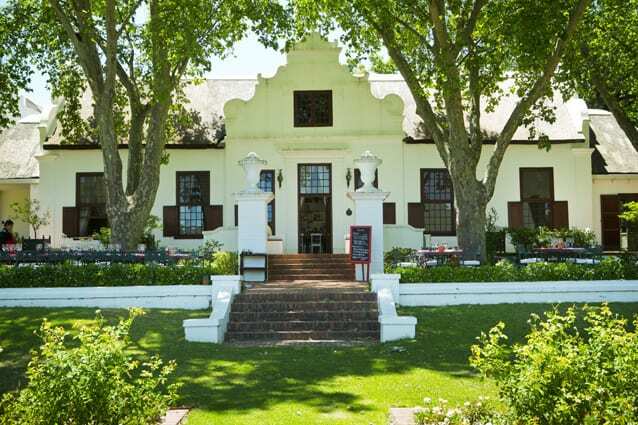 To book, phone 021-8775155 or email: theredtable@nederburg.co.za. The experience is available Tuesday to Sunday until the end of August (or while stocks last!) and must be booked in advance. Dinners may also be possible, by prior arrangement.